BBC One - Last Tango in Halifax - Sally Wainwright: "When you invent characters, you’ve got to invent them, warts and all"
Sally Wainwright: "When you invent characters, you’ve got to invent them, warts and all"
Sally Wainwright is a BAFTA award-winning writer responsible for modern television classics such as At Home with the Braithwaites and the recent Happy Valley, also starring Last Tango in Halifax's Sarah Lancashire. In this interview she chats about creating the series, inspired by her mother rekindling a relationship and subsequently marrying her teenage sweetheart Alec, and hints at what we can expect in Series 3. While Alan and Celia were inspired by your own family, the other characters in Last Tango in Halifax are very much fictional. Is there a particular reason for this? 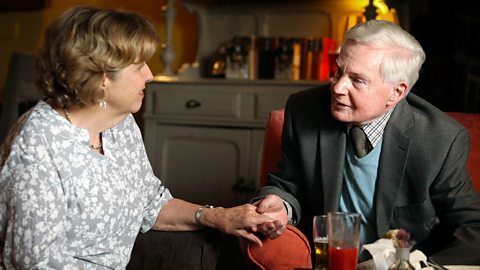 Alan and Celia were very much based on my mum and [her late husband ] Alec; their personalities and the relationship between them, although obviously I made things up! The family situations were completely different. I didn’t want to dramatise my family and I didn’t want to dramatise Alec’s family because I didn’t want to offend them in any way. Of course, when you invent characters, you’ve got to invent them, warts and all. They’re very flawed, all the characters, which is what makes people warm and human and funny really. So I wanted to be able to write as freely for them as I could without offending anyone. Celia and Alan plan a trip of a lifetime and a devastating event floors Caroline. When you were writing Caroline and Gillian, were you trying to write women who hadn’t been seen on screen before? That wasn’t my intention. I just wanted to write about two women who were very different to one another, so that there was that clash there. So though Celia and Alan are in love, there’s obvious drama in the fact that their daughters, the first time they meet, get off on completely the wrong foot. They appear to be poles apart in terms of professional careers and their attitude towards life – Gillian being very laid back and Caroline being pretty uptight and moral, despite finding out she’s gay in the course of that [first] series. It really wasn’t easy for Caroline to come to terms with that at all, because she’s so conventionally minded. Can you tell us anything about Rupert Graves’ character, Gary? Alan and Celia have had their big beautiful wedding now, so what’s next for their relationship? Well the character of Gary that really throws them into disarray. There’s not much drama in people being happy – it’s all nice and wonderful, but we felt that we needed to use their backgrounds because they’ve not seen each other for 60 years and they’ve got married really quickly. There’s vast swathes of their previous lives that actually neither of them know anything about and really the story is about something from Alan’s past that he’d forgotten about himself. Gary represents this figure from his past – not that he has any reason to know who Gary is – but it’s devastating. It’s at a difficult time for Celia because Caroline and Kate are getting married. She wants to do the right thing and be there and look supportive, even though she struggles with it. And then the story between Alan and Gary erupts just before the wedding, and Celia takes out her frustration with Alan on Caroline. Would you like to write another series? Yes! I think there’s huge mileage [in the characters].